To see how our Pure Radiance C is so fundamentally different from other vitamin C supplements, all you have to do is unscrew the lid or open a capsule. Instead of being an unnaturally bright white like synthetic crystals of vitamin C, Pure Radiance C is a radiant mixture of tans, pinks and golds. 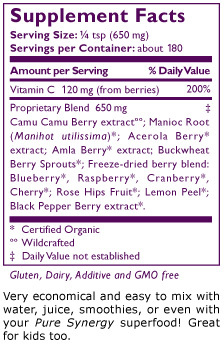 What you’re seeing is a vibrant, living blend of wild-crafted camu camu, and organic amla, acerola, blueberries, raspberries, lemons, cranberries, cherries, rose hips, and sprouts — 100% natural sources of vitamin C. And unlike isolated ascorbic acid powders, which have been chemically synthesized in a laboratory,Pure Radiance C provides all the well-researched, immune-supporting phytonutrients that only accompany genuine, 100% natural vitamin C.
Bursting with the proven goodness of 100% natural vitamin C, Pure Radiance Ccombines timeless nutritional wisdom with modern innovation. Its exquisite blend of certified organic and wild ingredients rich in vitamin C safely and effectively provides you with the many benefits of this indispensable nutrient. The world’s richest source of natural vitamin C (30-50 times more than an orange! ), our camu camu berries are wild harvested by the indigenous peoples of the Amazon rain forest and then gently juiced and dried to retain all their precious nutritional cargo. Your purchase not only supports your health, it also helps to preserve the planet's precious tropical ecosystem. Organically grown in the Himalayan valleys, amla is the most revered and regenerative herb in traditional Ayurvedic medicine. Called “Mother Nature” in India due to the myriad of medicinal properties they possess, amla berries are brimming with antioxidants including vitamin C, tannins and polyphenols, most notably ellagic acid. The luminous blues, purples, and reds of the berries and rose hips in our organic fruit blend reflect what’s buried within: natural pigments called flavonoids and anthocyanins which, alongside naturally occurring vitamin C, exhibit impressive antioxidant capacity to keep your body vital and well. Buckwheat berry sprouts are an abundant source of naturally occurring rutin and quercetin, two very important vitamin C co-factors. Black pepper berry extract has been shown to improve the uptake of vitamin C in the body—making sure this important vitamin can make its way to all the cells throughout your body. I use this product in adrenal cocktails and love it! A pure way to get Vitamin C into your daily diet! Been taking this product for over 6 years now~because it works so well- and is a food organic source & I have been fighting Sarcoma cancer for 23 years now & I know that Vitamin C is very important in fighting stage lV cancer-most VC supplements are dangerous synthetics with toxic excipients~ Pure Synergy products are so concerned about safe& healthy products ~ because I believe the founders name of Pure Synergy is Mr. Mitchell Mays & he had serious health problems of his own , before he started his company, I take 3 other products from Pure Synergy and I’d give them all 5 stars! Best tasting vit c powder out there, great ingredients. Great taste and even better great ingredients. I like this over any other vitamin c powder we have ever tried. This product is a prime example of the quality you can expect from the discretion Dr. Lawrence uses purchasing and offering herbs and supplements for the health of everyone. I believe this product gives direct almost immediate increase in natural energy and mental brightness. This vitamin C is easy to take by itself or mixed with my other vitamins. I like drinking it instead of taking another pill. It has also seemed to help keep colds at bay, & help with detoxing and cleansing.